Never ridden before? Don’t sweat it! The BRC1 is designed to get you comfortable on a bike and give you the skills you need to ride with confidence. The BRC1, or Basic Rider Course is being offered to beginner or intermediate riders from April to October. 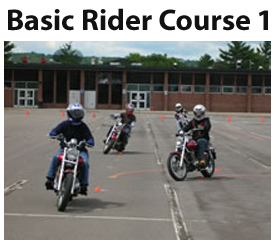 This course is perfect for the rider who wants to learn how to ride a motorcycle safely. Trust our experienced RiderCoaches and gain confidence in your motorcycle skills. Courses offered on weekends only. This course is designed to teach you how to ride with little or no experience. Get expert guidance from certified coaches during 2 or 3 days of training. 2 or 3-day course (Friday night classroom; Range exercises on Saturday & Sunday mornings, Saturday & Sunday afternoons, or all day Saturday range sessions). In the classroom, you’ll get to know the motorcycles you’ll be riding and learn the basics of rider safety skills. On the practice range, you’ll learn to safely accelerate, shifting, braking, turning, as well as proper procedures for taking curves, along with maneuvers like low-speed maneuvers, weaving, u-turns, swerving, controlling skids and surmounting obstacles. Motorcycles, helmets, eye protection, and full-fingered gloves are provided for student use during this course. Bring other riding gear (long sleeves–shirt or jacket, long pants, and sturdy over-the-ankle footwear) for the 2 days of range exercises. 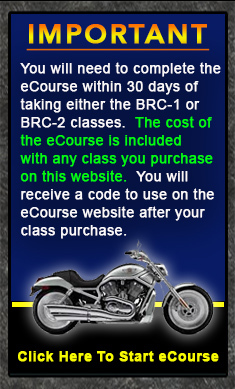 You do not need your temporary motorcycle license prior to taking this course. You will gain critical skills/techniques and confidence in the operation of your motorcycle from our Basic RiderCourse 1. MasterCard, Visa, Discover and American Express are now accepted for your convenience. Upon successful completion, you will be issued a motorcycle skills test (DMV Road Test) waiver necessary to obtain your motorcycle license (class M Endorsement) in Wisconsin. An MSF completion card will be issued to you in order to receive insurance discounts or military recertification. You will not be charged again if you are not successful in passing the first time! Register now to save your spot for upcoming classes. Please complete MSF’s Basic e-Course within 30 days of taking the BRC1 course. The cost of the Basic e-Course is included in our price of $250. Upon signing-up for one of our classes, you will receive a separate e-mail with a coupon code for you to enter into the lower right-hand corner of the registration page for MSF’s Basic e-Course. Students must bring the Basic e-Course completion certificate to class. FREE MSF Basic online e-Course with Registration of Class!